Saw this on a bottle of G Sake (SakeOne). 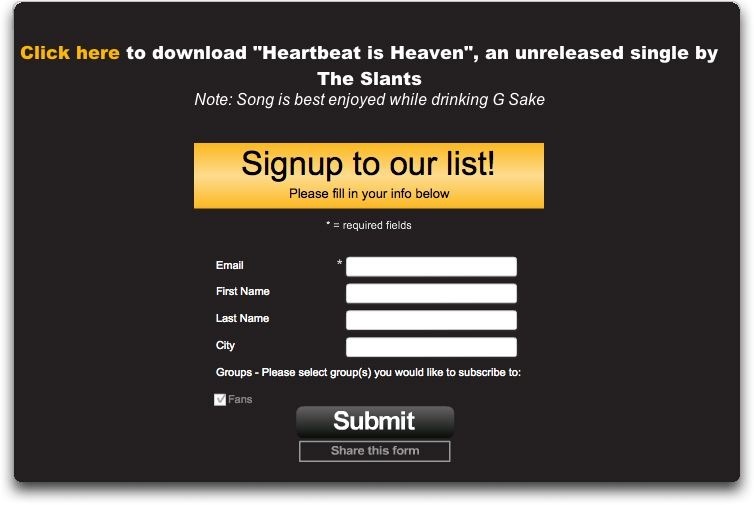 Takes you to their website (www.gliveswicked.com) where you can download an exclusive free song from the Slants – a band they are sponsoring. If you want people to go through the effort of connecting with you, reward them. Then it is immediate win-win. Could Mobile Apps Be Wilting? Here at InSequent we’ve staked our future on the mobile web as opposed to mobile apps. The link above is a good opinion piece that jibes with our thinking. You will undoubtedly see more of these going forward. We are seeing applications moving to the “cloud” in our traditional desktop world and there is no reason to think this won’t happen on mobile as well. HTML5 is one big reason why. The web is where mobile is going. Place your bets accordingly. Three trends for media execs to watch: mobile, local and social. If content is king, context is its crown. – Eric Schmidt, in his keynote at the Edinburgh International Television Festival. As part of our release of v2.08.06 this morning all business subscribers can automatically generate a free QR Code to go along with their keyword. This gives them the option of using the keyword or the QR Code as the method of interaction to display to their customers for deals, info and more. Also part of this release, and adding to the growing selection of Publisher tools, is a robust News/Sports/Weather Alerts system. InSequent already offers Publishers the ability to push Daily Deals to their reader’s mobile phones. Insequent’s mobile platform is being launched in 31 new US markets over the next two weeks. …in next two weeks. And an awesome new News/Sports/Weather Alerts module. And much more. Stay tuned for imminent updates. August/September/4Q will be huge. InSequent provides a full suite of tools for advertisers AND publishers. Thanks to all who work with us! I can say no more but trust me, it will be worth it.